From pin kits and key blanks to plug followers, from key duplicators to top of the line code machines, we have your key needs covered. We carry all the specialty tools, from your favorite picks to installation templates for your router. Automotive techs will find what they need, from opening tools to replacement locks, ignitions, and transponder tools. 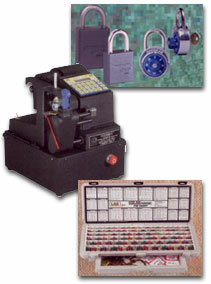 Add impulse items for your shop: padlocks, key rings, key hiders and realtor's lock boxes and much more.